Aerolíneas Argentinas, formally Aerolíneas Argentinas S.A., is Argentina's largest airline and the country's flag carrier. The airline was created in 1949 from the merger of four companies, and started operations in December 1950 (1950-12). A consortium led by Iberia took control of the airline in 1990, and Grupo Marsans acquired the company and its subsidiaries in 2001, following a period of severe financial difficulties that put the airline on the brink of closure. The company has been run by the Argentine government since late 2008, when the country regained control of the airline after it was taken over from the Spanish owners. As of December 2014[update], Aerolíneas Argentinas was state-owned. It has its headquarters in Buenos Aires. SkyTeam membership was achieved in late August 2012 (2012-08); the airline's cargo division became a member of SkyTeam Cargo in November 2013 (2013-11). Aerolíneas Argentinas and its sister company Austral Líneas Aéreas operates from two hubs, both located in Buenos Aires: Aeroparque Jorge Newbery and Ministro Pistarini International Airport. It's narrow body fleet, used on domestic and regional routes, consists of Boeing 737-700, 737-800 and 737 MAX 8, whereas intercontinental and transoceanic services are flown on the wide body Airbus A330-200 and A340-300. The history of the airline began in 1929, when Compagnie Générale Aéropostale (Aéropostale) started airmail operations between Buenos Aires and Asunción using Laté-25 equipment, later expanding its network to cities located in the Patagonia. Many French pilots (including aviator and author Antoine de Saint-Exupéry) flew for the company in its beginnings. Argentine personnel replaced the Frenchmen as they gradually withdrew from the airline, and shortly after Aéropostale's Argentine subsidiary Aeroposta Argentina was formed. In 1947, this airline became a mixed-stock company in which the government had a 20% stake and private investors held the balance. As Aeroposta expanded its network southwards and incorporated the Douglas DC-3 into its fleet, another three mixed-stock companies were in operation at the time: Aviación del Litoral Fluvial Argentino (ALFA) mainly operated flying boats northwards to the Mesopotamia, Flota Aérea Mercante Argentina (FAMA) operated overseas services with DC-4s as its mainstay equipment, and Zonas Oeste y Norte de Aerolíneas Argentinas (ZONDA) was mainly concerned with operations in the northwest region. These carriers became unprofitable and President Juan Perón had them amalgamated into a single state-owned company on 14 May 1949 (1949-05-14). The state holding was officially rebranded as Aerolíneas Argentinas-Empresa del Estado. The four companies comprising the state holding ceased independent operations on 31 December 1949 (1949-12-31). In the early 1960s, the fleet consisted of four Comet 4s, four Convair 240s, 15 DC-3s, six DC-4s, five DC-6s and six Sandringhams, whereas the ten F-27s ordered in 1957 were still pending delivery. The 1960s saw the carrier ordering the Avro 748 turboprop airliner. The aircraft started services on 15 February 1962 between Buenos Aires and Punta del Este. The first flight for the Caravelle in Aerolíneas colours was Buenos Aires–Santiago de Chile on 1 April 1962. At April 1965 (1965-04) the carrier had 5,960 employees, and the fleet consisted of three Comet 4s, one Comet 4C, three Caravelles, 12 DC-3s (three of them freighters), six DC-4s, three DC-6s and 12 HS-748s. In 1966, loans granted by the Ex-Im Bank and Boeing permitted the purchase of a number of Boeing 707-320Bs in a deal worth US$37,000,000 (equivalent to $285,715,897 in 2018). In November 1969 (1969-11), the carrier entered a pool agreement with Lufthansa covering services between Germany and Argentina. By March 1970 (1970-03), Aerolíneas Argentinas had a fleet of six Boeing 707s that served routes to Europe and the United States, three Caravelles 6Rs and four Comet 4s that flew regional services, and 12 HS-748s that flew domestically, whereas six Boeing 737-200s were on order. During the decade, the fleet had the arrival of three different aircraft types from Boeing: the 727—the first example entered the fleet in December 1977 (1977-12) on lease from Hughes AirWest and three more were ordered directly from Boeing—, the 737, and the 747. 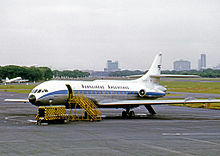 The incorporation of the Fokker F-28 into the fleet in the mid-1970s prompted the withdrawal of the last HS-748s, making the company to be the first South American airline in operating an all-jet aircraft park. Frankfurt, Madrid, and Rome became the first destinations to be served with the new 747s, starting January 1977 (1977-01). Another milestone for the company took place in June 1980 (1980-06) with the first south polar scheduled service, linking Buenos Aires with Hong Kong via Auckland. Late that year, a second-hand Boeing 747SP was acquired from Braniff for US$51,000,000 (equivalent to $155,080,372 in 2018). The airline was assigned by law the monopoly of international operations from Argentina in 1971. This meant no other Argentine airline was able to operate international flights, let alone the already created Austral. The carrier therefore became the flag carrier of the country. The same law also assigned Aerolíneas Argentinas a 50% share of the domestic market. Following the acquisition of Austral by the Argentine government in 1980, both Aerolíneas Argentinas and Austral became government-owned, to the extent that some routes were simultaneously operated, even using similar equipment. However, a state of continuous tension existed over salary differences between both companies that eventually led the Aerolíneas Argentinas' pilots to a three-week-long strike that started on 1 July 1986. During this strike, the government leased pilots from the Argentine Air Force to operate some aircraft. Other companies took advantage from this situation and gained the market share Aerolíneas Argentinas lost, as domestic routes were operated by Austral, LADE, and LAPA, and the government temporarily authorised foreign carriers to exploit the company's international routes. During and shortly after the Falklands War in 1982, the company was banned from British airspace. A flight from London-Gatwick to Argentina's capital was once scheduled, but because of the ban, passengers bound to Argentina had to change planes at Madrid-Barajas. At March 1985 (1985-03), Aerolíneas Argentinas had 9,822 employees. At this time, the fleet comprised one Boeing 707-320B, one Boeing 707-320C, seven Boeing 727-200s, 10 Boeing 737-200s, two Boeing 737-200Cs, five Boeing 747-200Bs, one Boeing 747SP, two Fokker F28-1000s, and a Fokker F28-4000. The international network radiated from Buenos Aires and served Asuncion, Auckland, Bogotá, Cape Town, Caracas, Frankfurt, Guayaquil, Hong Kong, La Paz, Lima, Los Angeles, Madrid, Mexico City, Miami, Montevideo, Montreal, New York, Paris, Rio de Janeiro, Rome, Sao Paulo, Santiago, Porto Alegre, and Zurich. Sydney was first served in 1989 and flights to London resumed in January 1990 (1990-01). The privatisation of the company started being considered under the government of Raúl Alfonsín, when SAS was proposed to become a 40% shareholder of the state company. This was firmly resisted by the Peronist opposition. The staff had grown to 10,372 by March 1990 (1990-03). Assets (without routes, brand, etc., US$ mil.) 636-776 ? In 1990,[nb 3] a consortium led by Iberia and Austral's owner Cielos del Sur S.A. acquired an 85% stake in Aerolíneas Argentinas for US$130,000,000 (equivalent to $249,304,636 in 2018) in cash, the same amount to be injected within a 10-month period, and a debt-equity exchange worth US$2.01 billion. Another consortium led by Alitalia, American Airlines, KLM and Varig had earlier pulled out from the process. Paradoxically, one of the first actions taken by the new Peronist government was to privatise the carrier, after airily opposing to the privatisation propositions of its predecessor. The sale of the airline followed the divestiture of the government shareholding in the national telephone company, which took place earlier that month during the Carlos Menem presidency's privatisation wave, intended to divest the participation of the state in a number of enterprises to reduce the debt to foreign banks from US$40 billion to US$7 billion. Aimed at favouring the privatisation process, the government absorbed a US$741 million debt the company took between 1981 and 1982 for capitalisation purposes. Despite the carrier being regarded as overstaffed and bureaucratic, it was debt-free at that time, having an average profitability of US$90 million a year; it actually had US$719 million in revenues for the year prior to the privatisation. The privatisation contract, which specified the buyer should pay US$260 million in cash and US$1,610 million in external debt bonds, was ratified by the Supreme Court. Furthermore, a clause enabled the buyer to indebt Aerolíneas Argentinas for the buyout process; this was reflected in the airline's 1991 balance, which included debts worth US$390 million for its own acquisition. This privatisation process was not ruled as illegal until 2009. Austral's owner Cielos del Sur S.A. was sold to Iberia in March 1991 (1991-03), further increasing the Spanish flag carrier's stake in the Argentine air market. Aerolíneas Argentinas and Austral never merged throughout the private era, and remained as separate companies with the same shareholder. Iberia subsequently boosted its stake in the airline to 85% in April 1994 (1994-04) after a US$500,000,000 (equivalent to $845,195,330 in 2018) cash injection. Out of the remaining 15%, the Argentine government held the 5% stake it was initially assigned, while 10% belonged to the employees. Furthermore, at this stage the Argentine government resigned to the voting privilege it had in the directory of the airline. Iberia was subsequently obliged by the European Commission to cut its stake in Aerolíneas Argentinas as a condition for receiving state aid. It thence reduced its participation to 20%, transferring the remaining 65% to Interinvest/Andes holding, a consortium comprising the Spanish government holding company (SEPI) –the actual owner of Iberia before it was privatised in 2001– and banks Merrill Lynch and Bankers Trust, among others. In July 1997 (1997-07), Iberia cut again its stake in Aerolíneas Argentinas from 20% to 10%, while American Airlines's parent company AMR acquired a 10% stake of Aerolineas Argentinas/Austral's major stockholder Interinvest, equivalent to a participation of 8.5% in both Argentine companies, with the commitment of finding investors for Aerolíneas Argentinas. AMR's 8.5% operation was finally cleared by the United States Department of Justice in early July 1998. By that time, the Argentine government still owned a 5% stake in Aerolíneas Argentinas. Losses had mounted to US$927 million since 1992, totalling US$150 million only for 1999. The restructuring plan presented by AMR, mainly aimed at reverting these losses, was rejected by the SEPI. Furthermore, given that the AMR Corporation did not find purchasers for the company, the SEPI put the control of the airline back into Spanish hands. The vacancy left in the management positions that followed the departure of the AMR holding from Aerolíneas was soon filled in by the SEPI. To protect the interests of the Argentine national carrier, the government suspended an open skies agreement between Argentina and the United States that would come into force in September 2000 (2000-09). The airline had 5,384 employees at March 2000 (2000-03). At this time, the aircraft park consisted of two Airbus A310-300s, four Airbus A340-200s, four Boeing 737-200s, Boeing 737-200 Advanced, one Boeing 737-200C, and nine Boeing 747-200Bs, whereas six Airbus A340-600s were on order. [nb 4] The list of international destinations served at the time was Asunción, Auckland, Bogotá, Cancún, Caracas, Florianopolis, Lima, Madrid, Mexico City, Miami, Montevideo, New York, Orlando, Paris, Punta del Este, Rio de Janeiro, Rome, Santiago, São Paulo, and Sydney; domestic services to Catamarca, Comodoro Rivadavia, Cordoba, Corrientes, Esquel, Iguazu, Jujuy, La Rioja, Mar del Plata, Mendoza, Neuquen, Posadas, President Roque Saenz Pena, Resistencia, Rio Gallegos, Rio Grande, Rosario, Salta, San Carlos de Bariloche, Santa Cruz, Santa Fe, Santiago del Estero, Trelew, Tucuman, Ushuaia, and Villa Gesell were also operated. Allegations of corruption were made on the basis of the price paid by Iberia and the Spanish firm's ulterior conduct (including some convoluted lease-back operations), with the airline paying the price for its own purchase with its assets. Subsequent management by American Airlines and SEPI drove Aerolíneas Argentinas into an almost terminal crisis in 2001. In June 2001 (2001-06), the aftermath began after the airline filed for bankruptcy protection from creditors, and went into administration; the salaries were paid by the Argentine government, instead of using money coming from the SEPI. The payment of salaries for the upcoming months was suspended, as the mechanics union refused to accept the reorganisation plan raised by the SEPI to keep the company afloat. On 6 June, flights to Auckland, Los Angeles, Miami, New York, São Paulo, Sydney and Rio de Janeiro were halted. Owing to a US$15 million debt with the fuel supplier, the suspension of the daily flight to Madrid, which also served Rome and was the last connection with Europe, followed a week later. After this, most of the fleet was grounded, and only 30% and 10% of domestic and international flights, respectively, were operating. Marsans group acquired a 92% stake through its subsidiary Air Comet from the SEPI in late 2001, and committed to inject US$50 million capital with the intention of resuming short– as well as long–haul services. The resumption of international flights started in early November 2001 (2001-11). At July 2002 (2002-07), the airline and its subsidiaries employed 7,090. The company exited bankruptcy in January 2003 (2003-01) and emerged from administration a month later. That year, the first profit in five years was announced, along with an important increase in market share. In May 2008 (2008-05), an initial agreement between the Argentine government and Grupo Marsans in which the latter would decrease its participation in the airline to 35% was announced; in reducing their holding, Marsans would make room for new private investors, as well as for the government of Argentina to increase its stake in the airline from 5 to 20%. Amid accusations from Marsans and following the disclosure of an agreement, the Argentine government took the airline back into state control in July 2008 (2008-07) after acquiring 99.4% of the stake for an undisclosed price; the remaining 0.6% continued being owned by the company's employees. At this time, the company had 40% of its fleet grounded. The act renationalising Aerolíneas Argentinas and its subsidiary Austral Líneas Aéreas was passed by the Chamber of Deputies in August 2008, and became law in September 2008 (2008-09) following the 46-21 vote in the Argentine Senate. There were disagreements regarding the value to be paid by Grupo Marsans to the government. Negotiations fell through, and an administrator was appointed by an Argentine court in November that year to oversee the running of the company. A vote by both the lower and the upper houses of the Argentine Congress in support of taking over the company and its subsidiaries took place in December, when the Chamber of Deputies voted 152-84 in favor of the expropriation, and the Senate approved the bill by a 42-20 vote. In March 2011 (2011-03), the different unions that affiliate the airline staff demonstrated over concerns the government was looking for local private investors to participate in ownership of the company. In September that year, the airline emerged from the reorganisation proceedings it had filed in 2001. In late November 2011 (2011-11), the government announced an austerity plan for the company to reduce the deficit it has been incurring since being taken over from Marsans; the plan included the revision of unprofitable routes, the reduction of pilot/aircraft pay rates, and the abandonment of obsolete equipment, among others. Passenger traffic for the group reached a record 8.5 million in 2013, a 57% increase from the time of its renationalization in 2008. Revenues rose to a record of US$2 billion in 2013, an 85% increase from 2008 levels; losses likewise declined from $860 million (78% of revenues) to $250 million (12% of revenues). Corporate assets as of 2012 had tripled to over $1.6 billion, as the group's fleet grew from 26 to 63 planes and the average age of same was reduced from 20 years to 7.5. In 2017, projections for 2018 were given at 14.5 million passengers and a loss of $90 million. Austral Líneas Aéreas is a subsidiary of Aerolíneas Argentinas. Aerolíneas Argentinas was completely owned by the government of Argentina, as of December 2014[update]. As of December 2013[update], Aerolíneas Argentinas Cargo, domestic airline Austral Líneas Aéreas, ramp service provider Aerohandling, cargo division JetPaq S.A., and tourism operator Optar S.A. are listed as Aerolíneas Argentinas subsidiaries. The airline and its subsidiaries operate from two hubs, both located in Buenos Aires. Operations of domestic and regional flights by the smaller aircraft types in the fleet are concentrated at Aeroparque Jorge Newbery, which also serves as its operating base, whereas Ministro Pistarini International Airport is mainly used for international services, although some regional and a few domestic services are operated, as well. The company provides free-of-charge transportation to those passengers who need to change from one airport to the other. As of April 2014[update], the airline and its subsidiaries employ 11,515. As of December 2017[update], Mario Dell'Acqua holds the president position. Aerolíneas Argentinas is headquartered at Aeroparque Jorge Newbery, located in Buenos Aires city. With the mentoring of Delta Air Lines, the company signed an agreement to begin the process of joining SkyTeam in late November 2010 (2010-11). It became the first South American and the second Latin American carrier in joining the alliance in August 2012 (2012-08), as well as its 18th overall member. The airline's cargo division, Aerolíneas Argentinas Cargo, joined SkyTeam Cargo in November 2013 (2013-11), becoming the 12th member airline of the alliance. An Aerolíneas Argentinas Airbus A340-300 on short final to Leonardo da Vinci-Fiumicino Airport in 2012. Aerolíneas Argentinas, excluding its subsidiary Austral, operates the following aircraft as of June 2018[update]. A Boeing 737-200 at Aeroparque Jorge Newbery in 2009. A number of aircraft of this type had been leased from Pegasus Aviation in 1999. An HS 748 at Aeroparque Jorge Newbery in 1972. Aerolíneas Argentinas began to modernise its fleet in 2009, when it agreed to lease 10 Boeing 737-700s and to purchase two more of these aircraft that would act as a replacement for the ageing Boeing 737-200s and MD-80s. Along with the first leased ones, the two brand new aircraft, which became the first ones acquired by the company in 17 years, were incorporated into the fleet in mid-2009. In November, the Boeing 737-200 made its last flight on a scheduled Buenos Aires–Catamarca–La Rioja–Buenos Aires passenger service. In October 2009 (2009-10), the carrier had announced it was looking for about six Boeing 737-800 aircraft, both to complement the 12 Boeing 737-700s and to replace the ageing Boeing 737-500s. In late November 2010 (2010-11), the airline agreed to lease a further ten aircraft of the –700 series from ILFC, which started being delivered in April 2011. As of November 2012[update], the airline was considering both the Airbus A350-900 and the Boeing 787-9 as replacement aircraft for the long-haul fleet. The incorporation of leased Airbus A330-200s in 2013 for serving routes to Bogotá, Cancún, Caracas and Miami was also planned, whereas an increased maximum takeoff weight version of the same type was also under consideration to partly replace the Airbus A340-200s by 2016. In April 2013 (2013-04), Air Lease Corporation announced the lease of six Boeing 737-800s to the company, with deliveries starting in November 2014 (2014-11); in May 2013 (2013-05), CIT Aerospace announced the lease of four additional aircraft of the same type, with deliveries starting in January 2014 (2014-01). In October the same year, an agreement for the acquisition of 20 more aircraft of the type, worth US$1.8 billion, was announced. In addition to the lease of four used Airbus A330-200s from ILFC —the first of them delivered in September 2013 (2013-09)— Aerolíneas Argentinas signed in November a memorandum of understanding with Airbus, aimed at acquiring four more aircraft of the type. In a transaction worth US$887 million, the order was firmed up in February 2014 (2014-02). These aircraft will be fitted with GE Aviation CF6-80E1 engines. The first Airbus A330-200 directly purchased from Airbus was delivered in March 2015 (2015-03). With its ageing long-haul fleet in need of replacement, Aerolineas CEO Mario Dell’Acqua stated in November 2017 that the company was evaluating a replacement for the Airbus A340, with a decision to be made in 2018. The company was considering either the Boeing 787 or the Airbus A350 as possible replacements, with the intention of the new fleet entering service in 2020. The Airbus A330 will also be replaced as part of the long-haul fleet replacement, though they are to be retired progressively after the A340s. In November 2017, Aerolíneas Argentinas became the first Latin American airline in taking delivery of a Boeing 737 MAX 8; the aircraft flew its first revenue service on the Buenos Aires-Ezeiza–Mendoza route. In June 2010 (2010-06), Aerolíneas Argentinas revamped its image to give the airline a more modern appearance. The new logo is a combination of light blue and grey colours. Likewise, the previous eurowhite livery is replaced with a combination of the Argentine flag colours plus grey. Subsidiary airline Austral also adopted this new livery, additionally including a red cheatline. According to the Aviation Safety Network database, the last accident involving a company's aircraft that yielded fatalities was in 1970, as of October 2011[update]; Aviation Safety Network records 43 accidents or incidents for Aerolíneas Argentinas since it started operations in 1950. The company ranks among the safest airlines in the world. ^ The figures for this particular year are discrepant as Flight also informed the total number of carried passengers for 1954 to be 280,683. ^ Despite Flight confirming the order a week later, the carrier never operated the type. ^ There is a discrepancy regarding the precise date of the award, as it was informed to be in July 1990 and in November the same year. ^ The airline never operated the type. ^ Information concerning seat configuration is accurate for most of the fleet; nevertheless, on some equipment this information differs from the one shown in the table. ^ These figures include firm orders placed directly by the carrier and those by lessors assigned to the carrier. ^ a b Hofmann, Kurt (9 May 2016). "Aerolíneas Argentinas increases frequencies to Europe". Air Transport World. Archived from the original on 10 May 2016. ^ a b Karp, Aaron (28 August 2017). "Etihad, Aerolíneas Argentinas start codesharing". Air Transport World. Archived from the original on 1 September 2017. ^ a b c d e f "Memoria y Estados Contables" (PDF). Retrieved 31 May 2018. ^ a b "Argentina: Aerolineas Argentinas faces a tough turnaround with government's new liberal mindset". CAPA Centre for Aviation. 19 September 2016. Archived from the original on 22 September 2016. ^ "American Airlines opts to erect protective measures against Argentina's weak economy". CAPA Centre for Aviation. 16 October 2014. Archived from the original on 22 October 2014. Overall, seat deployment between the two countries has grown 4.8% year-on-year driven by a 17.5% seat increase from Aerolineas Argentinas. During the last year Argentina’s national airline has restarted service from Buenos Aires to New York JFK. Hansen, Ronald (5 September 1958). "Argentine awakening... Birth and Rebirth of Commercial Aviation: Problems for the Future (page 417)" (PDF). Flight: 417–419. Archived from the original on 3 May 2012. Retrieved 3 May 2012. "Argentine awakening... Birth and Rebirth of Commercial Aviation: Problems for the Future (page 418)". Flight. Archived from the original on 3 May 2012. Retrieved 3 May 2012. "Argentine awakening... Birth and Rebirth of Commercial Aviation: Problems for the Future (page 419)". Flight. Archived from the original on 3 May 2012. Retrieved 3 May 2012. ^ a b Plummer, Robert (22 July 2008). "Argentine airline set for bumpy ride". BBC News. Archived from the original on 24 April 2012. Retrieved 24 April 2012. Hardy, M. J. (6 March 1959). "Comets for Argentina (page 315)". Flight: 315–316. Archived from the original on 3 May 2012. Retrieved 3 May 2011. "Comets for Argentina (page 316)". Flight. Archived from the original on 3 May 2012. Retrieved 3 May 2011. ^ "World Airline Survey – Aerolineas Argentinas". Flight International: 551. 13 April 1967. Archived from the original on 3 May 2012. Retrieved 5 October 2012. ^ a b c d "World airline survey... Aerolineas Argentinas-Empresa del Estado". Flight International: 507. 11 April 1963. Archived from the original on 3 May 2012. ^ "World Airline Directory – Aerolineas Argentinas". Flight International: 48. 20–26 March 2001. Archived from the original on 5 October 2012. Retrieved 5 October 2012. ^ "Civil aviation news..." Flight: 268. 23 February 1950. Archived from the original on 1 June 2013. The Argentine Ministry of Transport has purchased five new Convairs for use on the passenger services of Aerolineas Argentinas. ^ "Argentina–Germany again". Flight: 628. 28 December 1950. Archived from the original on 5 October 2012. Retrieved 5 October 2012. ^ "The world's airlines – Aerolineas Argentinas". Flight: 310. 6 March 1953. Archived from the original on 2 August 2012. Retrieved 2 August 2012. ^ "World airline directory – Aerolineas Argentinas E.N.T." Flight. 69 (2465): 461. 20 April 1956. Archived from the original on 20 June 2012. ^ "World Airline Directory – Aerolineas Argentinas". Flight. 67 (2407): 304. 11 March 1955. Archived from the original on 28 October 2013. ^ "World airline directory – Aerolineas Argentinas-Empresa del Estado". Flight. 71 (2519): 594. 3 May 1957. Archived from the original on 22 September 2013. ^ "Brevities". Flight. 71 (2507): 193. 8 February 1957. Archived from the original on 22 September 2013. Aerolineas Argentinas have ordered ten F.27 Friendships for their inland services. ^ "Civil aviation – Friendship orders mount". Flight. 71 (2508). 15 February 1957. Archived from the original on 22 September 2013. ^ a b c "Aerolineas Argentinas Fleet". AeroTransport Data Bank. 20 July 2014. Archived from the original on 20 July 2014. ^ "Brevities". Flight. 78 (2682): 199. 5 August 1960. Archived from the original on 22 September 2013. Aerolineas took delivery of their sixth Comet 4 at Hatfield on July 25. The first overseas operator to buy Comets, their order is now complete. ^ "Hatfield to buenos aires by comet 4". Flight: 15. 13 March 1959. Archived from the original on 6 August 2017. ^ "Air commerce..." Flight. 75 (2618): 445. 27 March 1959. Archived from the original on 6 August 2017. Harbron, John D. (7 October 1960). "Argentina's State airline (page 589)". Flight. 78 (2691). Archived from the original on 7 December 2013. "Argentina's State airline (page 590)". Flight. Archived from the original on 7 December 2013. ^ a b c "World Airline Directory – Aerolineas Argentinas". Flight. 77 (2665): 489. 8 April 1960. Archived from the original on 23 September 2013. ^ "Air commerce". Flight. 80 (2740): 457. 14 September 1961. Archived from the original on 7 August 2017. ^ a b c d e f "World airline survey – Aerolineas Argentinas". Flight International. 87 (2927): 563. 15 April 1965. Archived from the original on 21 September 2013. ^ "Air transport – Loan for Aerolineas 707s". Flight International. 89 (2969): 174. 3 February 1966. Archived from the original on 21 September 2013. Doubts about the firmness of the proposal of Aerolineas Argentinas to buy Boeing 707-320Bs were dispelled last month when the Export-Import Board authorised a loan of $25 million (£9 million) for the purchase. Credit to a total of $4 million (£1.6 million), to help to meet the total cost of $37 million (£13 million), has been extended by Boeing. ^ "Air transport – South Atlantic Pool". Flight International. 97 (3184): 419. 19 March 1970. Archived from the original on 21 September 2013. Lufthansa and Aerolineas Argentinas have entered into a pool agreement covering traffic between their two countries. The agreement is retrospectively effective from November 1, 1969. ^ "World airlines 1970 – Aerolineas Argentinas". Flight International. 97 (3185): 465. 26 March 1970. Archived from the original on 21 September 2013. ^ "Airliner market". Flight International. 113 (3590). 7 January 1978. Archived from the original on 10 August 2017. ^ "Airliner market". Flight International. 113 (3593): 226. 28 January 1978. Archived from the original on 10 August 2017. ^ "World airlines update". Flight International: 512. 17 October 1974. Archived from the original on 21 May 2013. Aerolineas Argentinas has ordered three more 737-200s for delivery later this month and in November and December, bringing its fleet of the type to 12. ^ "Airliner market". Flight International: 70. 8 July 1978. Archived from the original on 21 May 2013. Aerolineas Argentinas has ordered three additional Boeing 747-200Bs, with an option on a fourth subject to satisfactory financing. The aircraft will be powered by Pratt & Whitney JT9D-7Qs. This commitment for 747s, together with the airline's earlier purchase of three 727s, is worth some $200 million. ^ "Short hauls..." (PDF). Flight International: 83. 12 July 1980. Archived from the original on 3 May 2012. Retrieved 3 May 2012. Aerolineas Argentinas on June 7 inaugurated its Buenos Aires-Auckland-Hong Kong polar route. ^ "Airliner market". Flight International: 55. 10 January 1981. Archived from the original on 21 May 2013. Aerolineas Argentinas paid nearly $51 million for the almost-new Boeing 747SP purchased from Braniff last year. ^ a b c d Cionfrini, Ernesto (21 June 2001). "Errores, trampas y fracasos" [Errors, traps and failures]. La Nación (in Spanish). Archived from the original on 18 June 2012. Retrieved 18 June 2012. ^ "Air transport – Argentine airlines face reorganisation". Flight International. Buenos Aires: 7. 19 July 1986. Archived from the original on 21 May 2013. Argentina's flag carrier, Aerolineas Argentinas, has dismissed all 561 of its pilots after they went on indefinite strike on July 1. ^ Potenze, Pablo. "La gran huelga" [The large strike] (PDF) (in Spanish). Archived from the original (PDF) on 24 April 2012. Retrieved 18 June 2012. ^ "World airline directory – Aerolineas Argentinas". Flight International. 127 (3953): 31. 30 March 1985. ISSN 0015-3710. Archived from the original on 29 November 2013. ^ a b c d e f g "World Airline Directory – Aerolineas Argentinas". Flight International. 139 (4260): 44. 27 March – 2 April 1991. ISSN 0015-3710. Archived from the original on 15 January 2015. ^ Riding, Alan (28 November 1988). "International report; Argentina's Privatization Battle". The New York Times. Archived from the original on 23 June 2014. ^ "SAS plays dating game" (PDF). Flight International: 10. 27 August 1988. Archived from the original on 27 April 2012. Retrieved 28 April 2012. ^ "SAS achète 40% de la Compagnie nationale argentine" [SAS to acquire 40% of the Argentine national carrier] (in French). Le Monde. 10 February 1988. Archived from the original on 27 April 2012. Retrieved 16 May 2011. ^ a b c d e f g h i Thwaites Rey, Mabel (3 June 2001). "Crónica de una década que dejó a Aerolíneas al borde de la quiebra" [Chronicle of a decade that left Aerolíneas on the brink of bankruptcy] (in Spanish). Clarín. Archived from the original on 23 June 2014. ^ a b c Crettaz, José (2 March 2011). "Una empresa con historia peronista" [A company with a Peronist history] (in Spanish). La Nación. Archived from the original on 27 April 2012. ^ "World airline directory – Aerolineas Argentinas". Flight International. 137 (4207): 47. 14–20 March 1990. ISSN 0015-3710. Archived from the original on 29 November 2013. ^ a b c d "Aerolíneas suspendió los vuelos a los Estados Unidos, Oceanía y Brasil" [Aerolíneas suspended flights to the United States, Oceania and Brazil]. Clarín (in Spanish). 7 June 2001. Archived from the original on 22 June 2014. ^ Cebrián Echarri, Belén (3 October 2001). "La SEPI adjudica Aerolíneas Argentinas al grupo turístico español Marsans" [The SEPI awards Aerolíneas Argentinas to the Spanish tourist operator Marsans]. El País (in Spanish). Archived from the original on 23 June 2014. ^ a b c "Iberia takes control of Argentine carrier". Flight International. 138 (4226). 25–31 July 1990. ISSN 0015-3710. Archived from the original on 27 January 2017. ^ a b Ceriott, Luis (3 May 2001). "Una compañía aérea en serios aprietos" [An air company in serious predicaments]. Clarín (in Spanish). Archived from the original on 23 June 2014. ^ a b Christian, Shirley (23 November 1990). "Argentina Closes Sale Of Airline". The New York Times. Archived from the original on 18 February 2014. ^ a b "Aerolineas teeters on bankruptcy". BBC News. 29 May 2001. Archived from the original on 28 April 2012. ^ a b c d e f g "Informe de gestión y Plan de Negocios" [Management Report and Business Plan] (PDF) (in Spanish). Aerolíneas Argentinas. Archived from the original (PDF) on 7 August 2014. ^ "Company histories: the path to Aerolíneas Argentinas S.A." Funding Universe. Archived from the original on 28 April 2012. Retrieved 28 April 2012. ^ a b c d Ramon Lopez (15 July 1998). "American given all-clear to acquire stake in Aerolineas". Flightglobal.com. Washington D.C. Flight International. Archived from the original on 28 April 2012. Retrieved 28 April 2012. ^ "94 at a glance". Flightglobal.com. Airline Business. 1 February 1995. Archived from the original on 28 April 2012. Retrieved 28 April 2012. An Argentine federal tribunal clears the way for Iberia's $500 million injection into flag carrier Aerolineas Argentinas, taking the Spanish flag's stake in the carrier up to 85 per cent. ^ "Iberia controlará el 19% de Aerolíneas Argentinas en poder de Banesto y BCH" [Iberia will control the 19% stock of Aerolíneas Argentinas held by Banesto and BCH]. El País (in Spanish). 19 March 1994. Archived from the original on 23 June 2014. ^ "Deja Iberia líneas de América latina" [Iberia to step down from Latin American airlines]. La Nación (in Spanish). EFE. 1 February 1996. Archived from the original on 18 June 2012. ^ "1997 at a glance". Flightglobal. Airline Business. 1 March 1998. Archived from the original on 18 June 2012. American Airlines buys 10 per cent of Interinvest, the majority shareholder of Aerolineas Argentinas, while Iberia cuts its stake from 20 to 10 per cent. ^ "AA goes for Aerolineas". Flightglobal.com. Airline Business. 1 August 1998. Archived from the original on 18 June 2012. American Airlines has been cleared to proceed with its acquisition of 8.5 per cent of Aerolineas Argentinas. ^ a b "No Offer for Aerolineas Argentinas". The New York Times. 31 December 1999. Archived from the original on 23 June 2014. ^ "Airline Ownership Survey". Flightglobal.com. Airline Business. 1 July 1998. Archived from the original on 24 April 2012. ^ a b "Spanish take over Aerolineas reins". Flightglobal.com. Airline Business. 1 March 2000. Archived from the original on 31 August 2012. Retrieved 31 August 2012. ^ Norris, Guy; Lews, Paul (8 February 2000). "Executives to go in Argentine rescue". Flightglobal. Washington, D.C. Flight International. Archived from the original on 31 August 2012. ^ a b c d e f "World Airline Directory – Aerolineas Argentinas". Flight International. 157 (4720): 54. 21–27 March 2000. ISSN 0015-3710. Archived from the original on 3 May 2012. ^ "Aerolineas sale delay". BBC News. 17 August 2001. Archived from the original on 31 August 2012. Retrieved 31 August 2012. ^ "Aerolineas Argentinas files for protection". Flightglobal.com. Flight International. 26 June 2001. Archived from the original on 25 August 2012. Retrieved 25 August 2012. ^ a b c Knibb, David (1 November 2001). "Aerolineas plans fresh start as Marsans steps in". Seattle: Flightglobal.com. Airline Business. Archived from the original on 25 August 2012. Retrieved 25 August 2012. ^ Ares, Carlos (1 June 2001). "De la Rúa ordena pagar los salarios para frenar el conflicto de Aerolíneas Argentinas". El País. Archived from the original on 25 August 2012. Retrieved 25 August 2012. ^ "Aerolineas Argentinas approaches moment of truth". Flightglobal.com. Airline Business. 1 August 2001. Archived from the original on 25 August 2012. Retrieved 25 August 2012. ^ Knibb, David (1 July 2001). "SEPI provides bankruptcy shelter for ailing Aerolineas". Seattle: Flightglobal.com. Airline Business. Archived from the original on 25 August 2012. Retrieved 25 August 2012. The Aerolineas crisis stems from an impasse between one union and SEPI. Seven unions own 10% of Aerolineas. Four of them agreed last October to SEPI's restructuring plan. Two more have since agreed, but the mechanics have refused to budge. ^ "El Consejo de Administración de Aerolíneas Argentinas aprueba la suspensión de pagos" [Aerolíneas Argentinas Administration Council voted for the suspension of payments] (in Spanish). El País. 21 June 2001. Archived from the original on 25 August 2012. Retrieved 25 August 2012. ^ a b c "Aerolíneas retomó sus vuelos a Madrid" [Aerolíneas resumed flights to Madrid]. La Nación (in Spanish). 4 November 2001. Archived from the original on 22 June 2014. ^ "Routes". Flightglobal.com. Flight International. 19 June 2001. Archived from the original on 25 August 2012. Retrieved 25 August 2012. Aerolineas Argentinas is suspending flights to Auckland, Los Angeles, Miami, New York, Rio de Janeiro, São Paulo and Sydney, following financial problems. ^ Argañaraz, Juan Carlos (13 June 2001). "Suspenden los últimos vuelos a Europa" [Last flights to Europe suspended]. Clarín (in Spanish). Madrid. Archived from the original on 23 June 2014. ^ "Aerolíneas anunció la cancelación de sus vuelos a Madrid" [Aerolíneas announced the suspension of flights to Madrid]. La Nación (in Spanish). 12 June 2001. Archived from the original on 22 June 2014. ^ "Díaz Ferrán afronta su primer juicio por fraude fiscal con Aerolíneas Argentinas". ABC. EFE. 27 November 2013. Archived from the original on 23 June 2014. ^ Reals, Kerry (16 June 2008). "Aerolineas Argentinas sale nears". Flightglobal.com. Airline Business. Archived from the original on 31 August 2012. Retrieved 31 August 2012. Marsans acquired its stake in Aerolíneas Argentinas and sister carrier Austral in 2001 through its subsidiary Air Comet. ^ a b Knibb, David (1 February 2003). "Aerolineas pulls back from the brink". Seattle: Flightglobal.com. Airline Business. Archived from the original on 31 August 2012. Retrieved 31 August 2012. ^ "Regresó a Ezeiza un vuelo de Aerolíneas Argentinas procedente de Madrid" [Aerolíneas Argentinas flight from Madrid arrived] (in Spanish). La Nación. 6 November 2001. Archived from the original on 31 August 2012. Retrieved 31 August 2012. ^ "Un grupo de 5 empresas y más de 7.000 empleados" [A holding of five companies with more than 7,000 employees]. Clarín (in Spanish). 20 July 2002. Archived from the original on 23 June 2014. ^ Flores, Jackson (7 January 2003). "Aerolineas Argentinas restructuring plan wins court approval". Rio de Janeiro: Flightglobal.com. Flight International. Archived from the original on 25 August 2012. Retrieved 25 August 2012. ^ "Aerolineas plots regional growth". Flightglobal.com. Airline Business. 1 May 2003. Archived from the original on 31 August 2012. Retrieved 31 August 2012. ^ "Aerolineas Argentinas nationalization under consideration". Air Transport World. 14 July 2008. Archived from the original on 26 August 2012. Retrieved 26 August 2012. ^ Illiano, Cesar (11 July 2008). "Aerolineas Argentinas faces possibility of state takeover". USA Today. Reuters. Archived from the original on 22 June 2014. ^ "Marsans hits back at Argentina over airline- report". Reuters. 11 July 2008. Archived from the original on 23 June 2014. ^ "Other News - 07/17/2008". Air Transport World. 18 July 2008. Archived from the original on 26 August 2012. Retrieved 26 August 2012. ^ "Argentina moves to buy Aerolineas Argentinas and Austral from Spanish group". The Star Online. 22 July 2008. Archived from the original on 22 June 2014. Retrieved 22 June 2014. ^ Illiano, Cesar (14 July 2008). "UPDATE 2-Marsans to sell Aerolineas to Argentina-source". Reuters. Archived from the original on 23 June 2014. ^ Schweimler, Daniel (22 June 2008). "Argentina renationalises airline". Buenos Aires: BBC News. Archived from the original on 25 August 2012. Retrieved 25 August 2012. ^ "Argentina to buy back Aerolineas Argentinas". The Financial Express. 22 July 2008. Archived from the original on 22 June 2014. ^ "Aerolineas Argentinas renationalization passes first legislative hurdle". Air Transport World. 26 August 2008. Archived from the original on 25 August 2012. Retrieved 25 August 2012. ^ "Other News - 09/04/2008". Air Transport World. 5 September 2008. Archived from the original on 24 April 2012. Retrieved 25 August 2012. Argentine Senate authorized the renationalization of Aerolineas Argentinas by a 46-21 vote. ^ "Argentina buys back flag carrier". BBC News. 4 September 2008. Archived from the original on 25 April 2012. Retrieved 25 April 2012. ^ "La reestatización de Aerolíneas ya es ley" [Aerolíneas Argentinas' renationalisation becomes law] (in Spanish). Clarín. 4 September 2008. Archived from the original on 25 August 2012. Retrieved 25 August 2012. ^ "Other News - 11/24/2008". Air Transport World. 25 November 2008. Archived from the original on 26 August 2012. ^ Bergman, Lucas (21 November 2008). "Argentine court intervenes in Aerolineas Argentinas". Reuters. Archived from the original on 22 June 2014. ^ "Other News - 12/04/2008". Air Transport World. 5 December 2008. Archived from the original on 25 August 2012. Retrieved 25 August 2012. ^ "Argentina backs airline seizure". BBC News. 4 December 2008. Archived from the original on 25 August 2012. Retrieved 25 August 2012. Deputies voted 152 to 84 for the bill, which now goes to the Senate. ^ "Other News - 12/20/2008". Air Transport World. 22 December 2008. Archived from the original on 25 August 2012. Retrieved 25 August 2012. ^ Neumann, Jeannette (17 December 2008). "Argentine Senate approves takeover of Aerolineas Argentinas". USA Today. Archived from the original on 25 August 2012. Retrieved 25 August 2012. ^ Sanz, Juan Cruz (5 March 2011). "Aerolíneas: rechazo gremial al intento de privatización parcial" [Aerolíneas: partial privatisation attempts rejected by the Unions] (in Spanish). Clarín. Archived from the original on 25 August 2012. Retrieved 25 August 2012. ^ "Gremios aeronáuticos, contra la privatización de Aerolíneas Argentinas" [Unions oppose to the privatisation of Aerolíneas Argentinas] (in Spanish). La Razón. 5 March 2011. Archived from the original on 25 August 2012. Retrieved 25 August 2012. ^ Olivera, Francisco (2 March 2011). "El Gobierno les busca un socio privado a Aerolíneas y Austral" [The (Argentine) Government is seeking a private partner for Aerolíneas and Austral] (in Spanish). La Nación. Archived from the original on 25 August 2012. Retrieved 25 August 2012. ^ "Airline News". Air Transport World. 9 September 2011. Archived from the original on 25 August 2012. Retrieved 25 August 2012. Aerolineas Argentinas has emerged from its reorganization proceedings, filed in 2001. ^ Olivera, Francisco (22 November 2011). "Anuncian un fuerte recorte en los gastos de Aerolíneas" [Strong costs shortages announced for Aerolíneas] (in Spanish). La Nación. Archived from the original on 25 August 2012. Retrieved 25 August 2012. ^ a b c Origlia, Gabriela (5 December 2017). "Aerolíneas Argentinas licitará la renovación de su flota Embraer a inicios de 2018". La Nacion (in Spanish). Retrieved 6 December 2017. ^ "Air New Zealand to launch Buenos Aires with Aerolineas Argentinas codeshare & AsiaPac connections". CAPA Centre for Aviation. 18 December 2014. Archived from the original on 18 December 2014. ^ "Group Companies". Retrieved 2 December 2013. ^ "Profile on Aerolineas Argentinas". Centre for Aviation. Archived from the original on 5 October 2012. Retrieved 5 October 2012. ^ "Profile on Buenos Aires Ministro Pistarini Airport". Centre for Aviation. Archived from the original on 5 October 2012. Retrieved 5 October 2012. Hosting regional and international passenger and cargo services for over 20 airlines, the airport is a hub for Aerolineas Argentinas. ^ Sobie, Brendan (21 April 2010). "New life for Aerolineas Argentinas?". Washington D.C.: Flightglobal. Airline Business. Archived from the original on 18 December 2014. ^ "Aerolineas offers free transfer between airports" (Press release). Aerolíneas Argentinas. 3 December 2010. Archived from the original on 25 April 2012. Retrieved 25 April 2012. ^ Ceriotto, Luis (21 April 2014). "Aerolíneas: el Estado desembolsa 1,6 millón de dólares por día". Clarín. Archived from the original on 21 April 2014. ^ a b Nensel, Mark (5 December 2017). "MAX 8 comes to Latin America with first Aerolíneas Argentinas flight". Air Transport World. Archived from the original on 6 December 2017. ^ "Delta Welcomes Aerolineas Argentinas to SkyTeam Global Alliance" (Press release). Delta Air Lines. 30 August 2012. Archived from the original on 31 August 2012. Retrieved 31 August 2012. Aerolineas Argentinas' membership and integration into the global airline alliance is sponsored by Delta, founding member of SkyTeam. ^ "Aerolineas Argentinas continues to struggle as government protection from competition increases". Centre for Aviation. 3 January 2012. Archived from the original on 21 April 2012. Retrieved 25 April 2012. ^ Karp, Aaron (1 December 2010). "Aerolineas Argentinas inks official agreement to join SkyTeam in 2012". Air Transport World. Archived from the original on 25 April 2012. Retrieved 25 April 2012. ^ "Aerolíneas Argentinas Joins SkyTeam" (Press release). Buenos Aires: SkyTeam. 30 November 2010. Archived from the original on 25 April 2012. Retrieved 25 April 2012. ^ "Aerolineas Argentinas tries to overcome troubled past and continued challenges as it enters SkyTeam". Centre for Aviation. 30 August 2012. Archived from the original on 30 August 2012. Retrieved 30 August 2012. ^ Russell, Edward (30 August 2012). "Aerolineas Argentinas joins SkyTeam". Buenos Aires: Flightglobal.com. Archived from the original on 30 August 2012. Retrieved 30 August 2012. ^ Paylor, Anne (30 August 2012). "Aerolíneas Argentinas becomes SkyTeam's first South American member". Air Transport World. Archived from the original on 31 August 2012. Retrieved 31 August 2012. ^ Blachly, Linda (6 November 2013). "Aerolíneas Cargo joins SkyTeam Cargo Alliance". Air Transport World. Archived from the original on 3 December 2013. ^ "Aerolineas Argentinas Cargo Joins the SkyTeam Cargo Alliance" (Press release). SkyTeam Cargo. 6 November 2013. Archived from the original on 22 June 2014. ^ "Aerolíneas Argentinas Cargo has joined to Sky Team Cargo Alliance" (Press release). Aerolíneas Argentinas. November 2013. Archived from the original on 22 June 2014. ^ Blachly, Linda (6 June 2018). "Airline Routes-6 June 2018". Air Transport World. Archived from the original on 17 June 2018. Russia’s Aeroflot Airline inked a codeshare agreement with Aerolineas Argentinas, launching a joint daily Moscow-Buenos Aires service June 1. The flights are operated with a transfer in Madrid. Aeroflot operates the leg between Moscow and Madrid on Airbus A320/A321 and Boeing 737 aircraft, while Aerolineas Argentinas operates the Madrid-Buenos Aires leg using Airbus A330 and A340 aircraft. ^ Montag-Girmes, Polina (4 June 2018). "Aeroflot to codeshare with Aerolineas Argentinas". Air Transport World. Archived from the original on 17 June 2018. ^ Dron, Alan (26 May 2017). "Alitalia, Aerolíneas Argentinas step up cooperation". Air Transport World. Archived from the original on 26 May 2017. ^ "Aerolíneas Argentinas y El Al Israel Airlines anuncian acuerdo de código compartido". Aerolineas Argentinas S.A. Retrieved 22 September 2017. ^ "Aerolineas Argentinas Flota | Airfleets aviación". www.airfleets.es. Retrieved 1 June 2018. ^ "Flota / Fleet". www.aerolineas.com.ar (in Spanish). Retrieved 12 June 2017. ^ a b "Aerolíneas Argentinas presents the second B-737/700-2009 model- purchased from Boeing" (Press release). Aerolíneas Argentinas. 25 June 2009. Archived from the original on 22 August 2012. ^ a b "Aerolíneas Argentinas presents the first B-737/700-2009 model- purchased from Boeing" (Press release). Aerolíneas Argentinas. 8 June 2009. Archived from the original on 22 August 2012. ^ "Aerolíneas incorporó otro Airbus A-340 a su flota internacional" [Aerolíneas incorporated another Airbus A-340 to the international fleet] (Press release) (in Spanish). Aerolíneas Argentinas. 9 January 2012. Archived from the original on 25 August 2012. ^ "Aerolíneas Argentinas incorporó tres aeronaves a su flota internacional y de cabotaje" [Aerolíneas Argentinas incorporated three aircraft to their fleet] (Press release) (in Spanish). Aerolíneas Argentinas. 27 December 2011. Archived from the original on 25 August 2012. ^ a b "On board services". Aerolíneas Argentinas. Archived from the original on 22 June 2014. ^ Nensel, Mark (5 December 2017). "MAX 8 comes to Latin America with first Aerolíneas Argentinas flight". atwonline.com. Retrieved 1 June 2018. ^ Trimble, Stephen (27 January 2018). "Aerolineas Argentinas receives third 737 Max 8". Washington D.C.: Flightglobal. Archived from the original on 11 February 2018. ^ "Marketplace". Flightglobal. Flight International. 15 September 1999. Archived from the original on 7 February 2015. Pegasus Aviation has leased 15 ex-British Airways Boeing 737-200s to Argentinian flag carrier Aerolineas Argentinas. ^ Russell, Edward (30 August 2012). "Aerolineas seeks A330s for fleet". Buenos Aires: Flightglobal. Archived from the original on 21 December 2014. The carrier has seven A340-300s and four A340-200s, according to the Flightglobal Ascend database. ^ "Aerolineas Argentinas bids farewell to the Jumbo" (Press release). Aerolíneas Argentinas. 1 February 2012. Archived from the original on 30 March 2012. Retrieved 30 March 2012. ^ Bellucci, Marcelo (2 February 2012). "El gigante del aire de Aerolíneas aterrizó en Ezeiza por última vez" [Aerolíneas' giant of the skies landed at Ezeiza for the last time] (in Spanish). Clarín. Archived from the original on 25 March 2012. Retrieved 25 March 2012. ^ a b Endres, Günter (2002). Major Airlines of the World (Second Edition). Airlife. p. 5. ^ a b Bonnassies, Olivier (10 April 2013). "Bids for Aerolineas MD-80s due next week". London: Flightglobal. Archived from the original on 21 December 2014. The Aerolineas Argentinas fleet for sale includes a 1992-vintage MD-83 aircraft (MSN 53117) and a MD-88 (MSN 53049), also built in 1992. ^ "Aerolíneas inició el recambio de su flota de aviones" [Aerolíneas started renewing its fleet] (in Spanish). La Nación. 8 June 2009. Archived from the original on 25 August 2012. ^ "Boeing 737-200: la "chancha" hizo su vuelo de despedida" [Boeing 737-200: the "chancha" made her last flight] (in Spanish). Clarín. 16 November 2009. Archived from the original on 25 August 2012. Retrieved 25 August 2012. ^ Sobie, Brendan (17 October 2009). "Aerolineas seeks to lease six 737-800s". Flightglobal. Cartagena. Archived from the original on 22 August 2012. ^ Sobie, Brendan (22 November 2010). "ALTA 2010: Aerolineas to grow 737NG fleet through ILFC leases and new order". Flightglobal. Air Transport Intelligence news. Archived from the original on 25 August 2012. ^ "Leasing & Finance". Air Transport World. 19 April 2011. Archived from the original on 25 August 2012. Retrieved 25 August 2012. ILFC reached a five-year lease agreement with Aerolíneas Argentinas for 10 Boeing 737-700NG aircraft. Deliveries are expected to begin this month and be completed by October 2012. ^ Russell, Edward (16 November 2012). "ALTA: Aerolineas considering A350 or 787 order". Panama City: Flightglobal. Archived from the original on 19 November 2012. Retrieved 19 November 2012. ^ "Aerolineas Argentinas attempts unlikely turnaround following acquisition of A330s". Centre for Aviation. 6 December 2012. Archived from the original on 6 December 2012. Retrieved 6 December 2012. ^ "Air Lease Corporation Announces the Placement of Six New Boeing 737-800s with Aerolíneas Argentinas" (PDF) (Press release). Air Lease Corporation. 10 April 2013. Archived from the original (PDF) on 13 April 2013. ^ "Aircraft News". Air Transport World. 31 May 2013. Archived from the original on 31 May 2013. Aerolíneas Argentinas will lease four CFM56-7B26-powered Boeing 737-800s from CIT Aerospace. Deliveries will begin in January. ^ "CIT Aerospace Signs Leases With Aerolineas Argentinas For Four 737-800s" (Press release). CIT Group. 16 May 2013. Archived from the original on 21 May 2013. ^ Mutzabaugh, Ben (23 October 2013). "Aerolineas Argentinas orders 20 new Boeing 737s". USA Today. Archived from the original on 22 June 2014. ^ Toh, Mavis (22 October 2013). "Aerolineas signs for 20 737-800s". Flightglobal. Singapore. Archived from the original on 19 March 2014. ^ "Boeing, Aerolineas Argentinas Complete Agreement for 20 Next-Generation 737s" (Press release). Boeing. 21 October 2013. Archived from the original on 22 June 2014. ^ Russell, Edward (19 June 2013). "PARIS: Aerolineas leases four A330s from ILFC". Flightglobal. Paris. Archived from the original on 19 March 2014. ^ "Aircraft News". Air Transport World. 18 November 2013. Archived from the original on 2 December 2013. Aerolíneas Argentinas has signed an MOU with Airbus to acquire four A330-200s, as part of its international fleet consolidation. Two of the aircraft are to be delivered in the first half of 2015 and two in 2016. ^ Kaminski-Morrow, David (13 November 2013). "Aerolineas tentatively signs for four A330s". Flightglobal. Archived from the original on 19 March 2014. ^ Landauro, Inti (13 February 2014). "Airbus: Aerolineas Argentinas Orders Four A330-200 Aircraft". The Wall Street Journal. Archived from the original on 23 February 2014. ^ "Argentina carrier orders four A330-200s worth $887 million". The Economic Times. AFP. 13 February 2014. Archived from the original on 14 February 2014. ^ Kaminski-Morrow, David (13 February 2014). "Airbus confirms Aerolineas A330 purchase". Flightglobal. Archived from the original on 22 February 2014. ^ "Aerolíneas Argentinas places order for four A330-200s" (Press release). Airbus. 13 February 2014. Archived from the original on 14 February 2014. ^ Walker, Karen (13 February 2014). "Aerolineas to buy four more A330s". Air Transport World. Archived from the original on 22 February 2014. ^ "Aerolineas Argentinas receives first of four new A330-200s on order". CAPA Centre for Aviation. 3 March 2015. Archived from the original on 8 March 2015. ^ Blachly, Linda (2 March 2015). "Aerolíneas Argentinas takes delivery of first A330-200". Air Transport World. Archived from the original on 2 March 2015. ^ "Aerolineas Argentinas receives first of four new A330-200s on order" (Press release). Airbus. 2 March 2015. Archived from the original on 2 March 2015. ^ Yeo, Ghim-Lay (18 November 2017). "Aerolineas to debut 737 Max in December". Buenos Aires: Flightglobal. Archived from the original on 22 November 2017. ^ Yeo, Ghim-Lay (4 December 2017). "PICTURES: Aerolineas formally takes delivery of first 737 Max". Washington DC: Flightglobal. Archived from the original on 6 December 2017. ^ "Aerolineas Argentinas announces rebranding". Air Transport World. 18 June 2010. Archived from the original on 25 August 2012. Retrieved 25 August 2012. ^ "PHOTOS: Aerolíneas Argentinas reveals new corporate image". Flightglobal.com. 11 June 2010. Archived from the original on 24 April 2012. Retrieved 24 April 2012. ^ a b "New directions, new image" (PDF). p. 10. Archived from the original (PDF) on 24 April 2012. Retrieved 24 April 2012. ^ Uphoff, Rainer (24 June 2010). "PICTURE: Austral's first E-190". Flightglobal.com. Archived from the original on 25 August 2012. Retrieved 25 August 2012. ^ "Accident record for Aerolíneas Argentinas". Aviation Safety Network. 1 October 2011. Retrieved 2 October 2011. ^ "World's safest airlines – Aerolineas Argentinas". news.com.au. Archived from the original on 25 March 2012. Retrieved 25 March 2012.